Guard House Passage was a centuries old passageway running off Wine Street, Bristol. It was used as a billet for the ?Main Guard? during the Civil War (1642-43) and was owned by a Robert Yate in 1681. In the eighteenth and early nineteenth centuries it was used as a lock-up for criminals and between 1836 and 1844 it was the first Bristol police station. The gateway was removed during rebuilding in 1881 and re-erected in a garden in Bishopston before becoming part of Bristol Museum and Art Gallery where it is on permanent display. 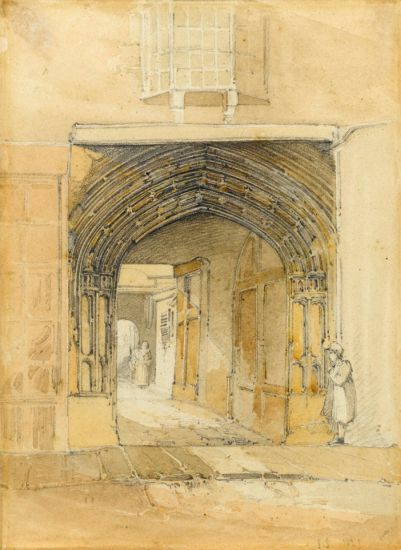 Another watercolour by Johnson of this subject dated 1820 is in Bristol Art Gallery (see Sheena Stoddard, Bristol before the Camera: The City in 1820-30, 2001, p.25, no.19, ill.).